This page launches a Perl CGI script that creates a 19 item table of random monsters based on dungeon level, climate region, geographic area, and other features. The potential results on the table, along with their assignment to levels and regions, are taken from the appendices to the AD&D Monster Manual II. Please note that the distribution of monster types on the resulting table reflects the likelihood of encountering a particular monster: in other words, common creatures for an area appear near the center of the table (where the largest number of 1d12 + 1d8 rolls will congregate) and very rare creatures are at the outer ends of the bell curve. Downloaded files can be opened in your favorite rich text format (RTF) editor, including MS Word and Open Office. Conditional drop-down menus are not standard in WordPress and I can’t see it being worthwhile to figure out the workaround. Therefore, pay attention to your selections above! 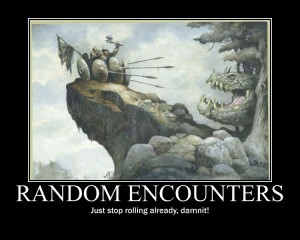 Choosing nonsensical combinations will get you nonsensical (or unintended) random encounter tables. There are some typographic errors in the results; these are artifacts from the Optical Character Recognition process used to pull the text into the script from a PDF of the Monster Manual II. Since some of the underlying tables include many entries for similar creatures (minimal animals, dinosaurs, pseudo-undead, etc. ), I have taken the liberty of collapsing these into single table entries so that these results don’t drown out the other possibilities. When a list of similar creatures appears on a single line of the random encounter table, roll appropriate dice to determine which of those monsters appears.